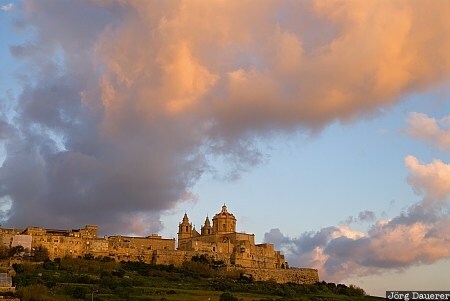 Colorful morning clouds above Mdina with its wall and its cathedral. Mdina used to be the capital of the Mediterranean island Malta. It is located in the center of the island. This photo was taken in the morning of a sunny day in March of 2009. This photo was taken with a digital camera.